Just like humans, an ounce of prevention is worth a pound of cure. 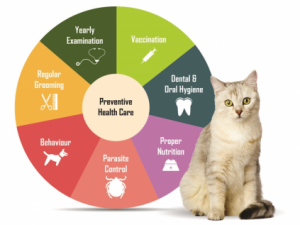 There are many facets to preventive care for animals. Below is just a small list of what we discuss with each of our clients and their pets. Even though we discuss these lists with each client, each pet is treated as an individual and their health needs are taken into account to provide them the best care possible. Our clinic has a comprehensive written safety and health program to ensure hazard prevention and infection control.